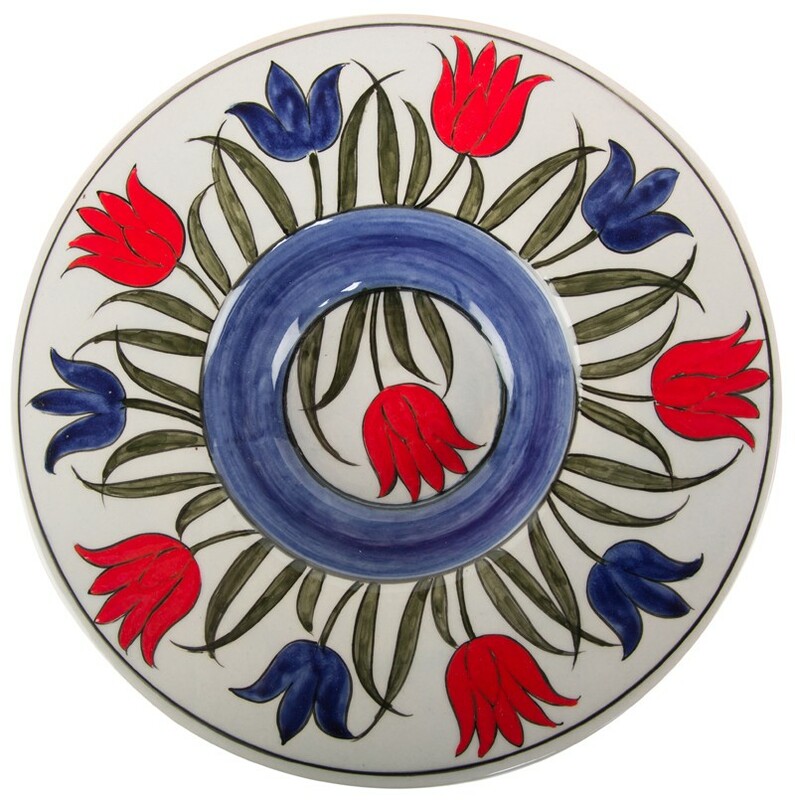 Tondino Iznik Ceramic Plate is designed and hand made by Meliha Coskun, one of the renowned master ceramics artists, whose works have been exhibited all over the world including the Smithsonian Museum Shops. The artist utilizes the quartz close to the way it was done in the 16th century and creates special and universal products combining the past with todays modern life. In addition, she uses all natural colours and produces her own blue, turquoise, black, green, and red colours to produce her own unique adaptations of Iznik designs. Tondino is the name given to the design of the plate which is specially ordered by Italians at 16th century. Material: The ceramic dough prepared by mixing the ground natural quartz crystals (62%) with clay and glass powder is hand shaped. An undercoat of 70*80% quartz is applied to the product. It is hand painted and decorated with traditional 15th and 16th century Iznik (Nicea) themes and fired at 950 degrees in a special furnace. After that the product is covered with a layer of glaze and baked at 910 C in the kiln. 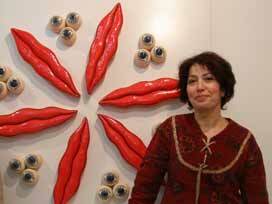 Meliha Coşkun graduated from the Ceramic Department in the Faculty of Fine Arts at Marmara University in 1983. Later on she studied at the Traditional Iznik Ceramic School and developed her own style of Seljuk pottery, Iznik, early Ottoman traditions. Between 1986 and 1987, she gave ceramics lessons in the Ceramic Department at Inönü University and Uludağ University. She completed her master’s degree in ceramics in 2000. Since 2008, Meliha Coşkun has served as a teacher in the Ceramic Department of the Faculty of Fine Arts at Marmara University. Today she is one of Turkey’s renowned master ceramic artists and her works have been showcased all over the world including Smithsonian Museum Shops. She participated in the Smithsonian Silk Road Festival in 2002. As a ceramic artist, Coşkun is known to utilize the quartz close to the way it was done in the 16th century. It is a challenging process that gives depth and whiteness to her ceramics. In addition, she uses all natural colors and produces her own blue, turquoise, black, green, and red colors to produce her own unique adaptations of Iznik designs. Meliha Coşkun is one of renowned master ceramic artists and her works have been exhibited all over the world including Smithsonian Museum Shops. Meliha Coşkun currently continues to make ceramics nearby Bursa.